As Donald Trump trivialized Khizr Khan's speech at the DNC convention with contempt saying Khan's wife was not allowed to talk--reinforcing the stereotype of 'Oppressed Muslim Women'--another Muslim-American woman stepped forward in the limelight as a fitting response to his diatribe. As the first hijab-wearing American Olympic athlete to represent America, Ibtihaj Muhammad has broken a hitherto stringent stereotype. In her recent statements, Muhammad has expressed concerns about her safety as an African-American Muslim and considered Donald Trump's words dangerous. On Monday Ibtihaj Muhammad became the first American athlete to compete in the Olympics with a hijab. According to an Associated Press Report, she ranked eighth in the world in sabre, beating Ukranian Olena Kravatska 15-13 in her first match before falling to France's Cecilia Berder 15-12 in the round of 16. Muhammad is quite vocal about her identity as an American Muslim. She is bubbling with energy since she won the World Cup and remains ever willing to exploit the media focus to raise her voice against rising Islamophobia, bigotry and hatred against Muslims in America. "I think his words are very dangerous ... when these types of comments are made, no one thinks about how they really affect people. I'm African-American. I don't have another home to go to. My family was born here. I was born here. I've grown up in Jersey. All my family's from Jersey. It's like, well, where do we go?," she told CNN commenting on Trump's remarks about banning Muslims. Muhammad is quite vocal about the rising anti-Muslim rhetoric in US politics. Talking to the Daily Beast she said, "I feel unsafe all the time. I had someone follow me home from practice and try to report me to police." According to a Washington Post report commenting on the anti-Islamic rhetoric of the Republican presidential-candidate Trump, she says, "I have to challenge this idea that in some way we don't belong because of our race or our religion." The 30-year-old fencer has been on fire since she secured her spot in the 2016 Olympics by earning two bronze medals for America at the World Cup held in Athens. She was chosen as one of the Time's magazine's 100 most influential people of 2016 and recently met President Obama at the White House. 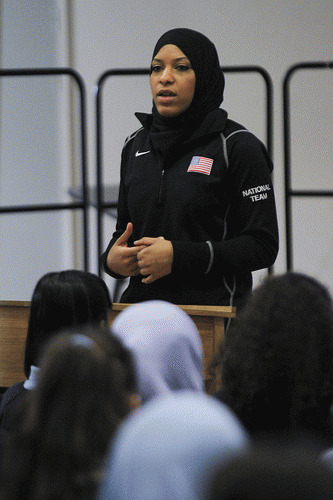 "I'm hopeful that, in my efforts to represent our country well as an athlete "- that they change the rhetoric around how people think and perceive the Muslim community," she told CNN. As a fashion designer running her own online outlet, a fencer who won multiple bronze medals for the US in the Athens World Cup and now an athlete who represented America in the Rio Olympics, Muhammad is a role model, a history-maker and a stereotype-breaker, all in one. Let's see how Trump ridicules and respond to this new breed of Muslim Americans who provide undeniable proves of their loyalty to the state but are still chased.